* Recommended for all dogs but not required. 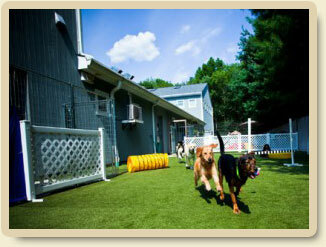 Certification from a veterinarian is required from each of our guests before admittance can be allowed. If your pet requires an updated vaccination please make arrangements for the vaccination to be administered no less than 10 days before any boarding is scheduled. *This vaccine is not a requirement however we highly recommend all dogs coming to lodge receive this vaccination. Please consult with your veterinarian to make the best decision for your beloved pet. Unlike any other pet care facility, Morris Animal Inn has a Pet Wellness department dedicated to the health and wellness of your pet. Additionally, we retain a veterinarian on call 24 hours a day in case of emergency. If your pet should require medical attention while in our care our protocol is to contact your veterinarian. Should the nature of your pet’s illness require an office visit we reserve the right to utilize our on-call veterinarian (this decision depends on the illness and the travel time to your veterinarian). Our caring staff can administer any oral or topical medications your dog may require during their visit.